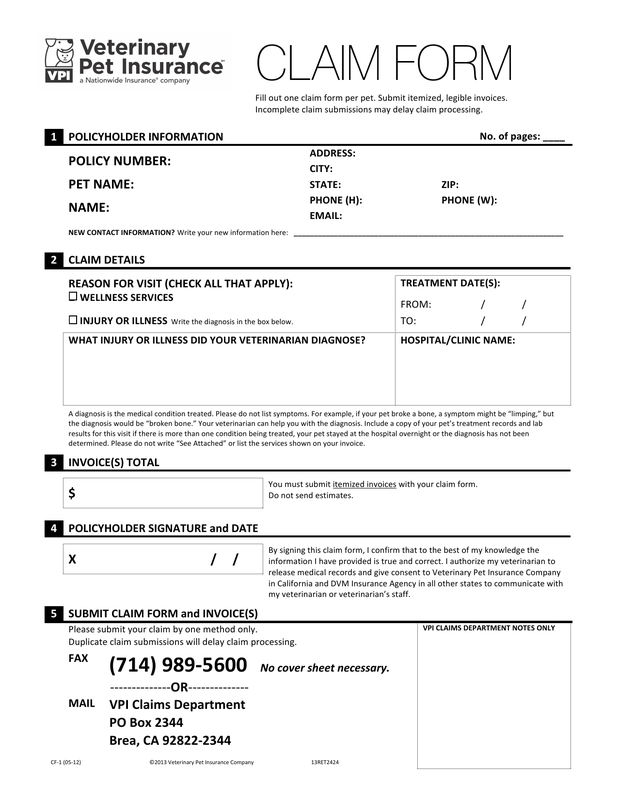 Download Veterinary Pet Insurance (VPI) Claim Form. This is a claim form for VIP Pet Insurance Company. This form is used to file a claim for any pet who is covered under one of their policies, whether it is for a pet wellness check up, illness or injury. By Signing this claim form, I confirm that to the best of my knowledge the information I have provided is true and correct. I authorize my veterinarian to release medical records and give consent to the Veterinary Pet Insurance Company in California and DMV Insurance Agency in all other states to communicate with my veterinarian or veterinarian’s staff. Submit your claim by only one method, duplicates will only cause delays in claim processing. Be certain to enclose all invoices.